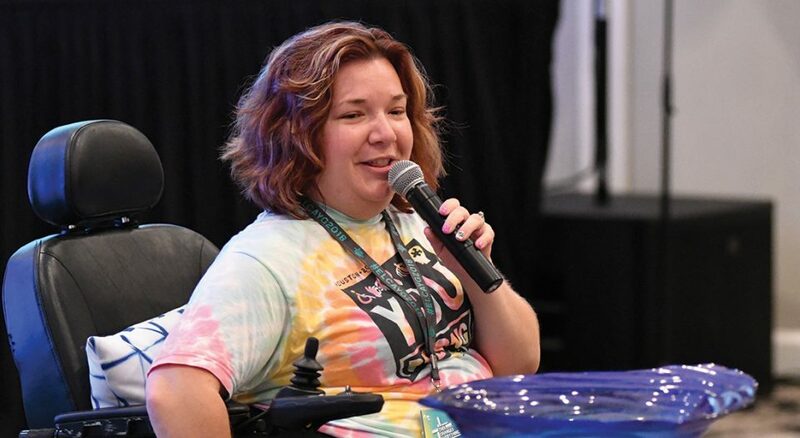 Before the 2018 ELCA Youth Gathering kicked off on June 27 in Houston, some attendees arrived earlier in the week to participate in pre-events—the Multicultural Youth Leadership Event (MYLE) and the tAble (formerly the Definitely-Abled Youth Leadership Event, DAYLE). MYLE is designed for youth of color and those whose primary language isn’t English. The tAble is for youth with a range of physical, cognitive and emotional disabilities. These pre-events, which embrace and embody the church’s commitments to diversity and inclusivity, gave youth a chance to spend time together in smaller groups to share their gifts and challenges, and to name and claim their place in the church and the gospel story. Around 600 participants at MYLE 2018 explored what it means to be one body, one mission, one household and one in Christ as they met under the theme “ONE,” which was based on Ephesians 2:14-19. Messages throughout the week revolved around unity and removing barriers that get in the way of human relationships and relationship with God. Many participants and adult leaders said they enjoyed the speakers during worship services and that a highlight was the music, which included songs in multiple languages. Arionna Witcher from Jones Leadership Academy in Toledo, Ohio, said her favorite parts of MYLE were the worship services because of their messages, saying they related to her life and gave helpful reminders. Arionna performed “Hello” by Adele in a MYLE talent show with another member of her group, Dannie Ellis. Both said they were comfortable performing the song at MYLE because they felt they were in an environment that was safe from judgment. MYLE attendees also participated in service projects as they talked about what it means to be one body with many gifts. Jeffrey Staton from Christ Lutheran Community Church in Upper Darby, Pa., went to a community center and worked with kids during his group’s service time. “We danced and played with the kids, and it was exciting and heartwarming to be with them and see that they wanted us to stay longer,” he said. In addition to service projects, several hands-on activities helped participants immerse themselves into the MYLE theme. 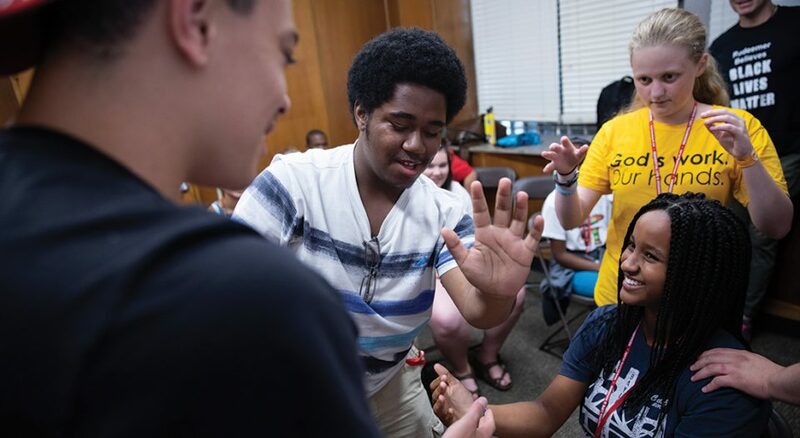 Discovery Worship was designed to help them explore their personal faith and how it connects them to others through a series of stations, including walking a labyrinth and writing letters to modern-day social justice activists. 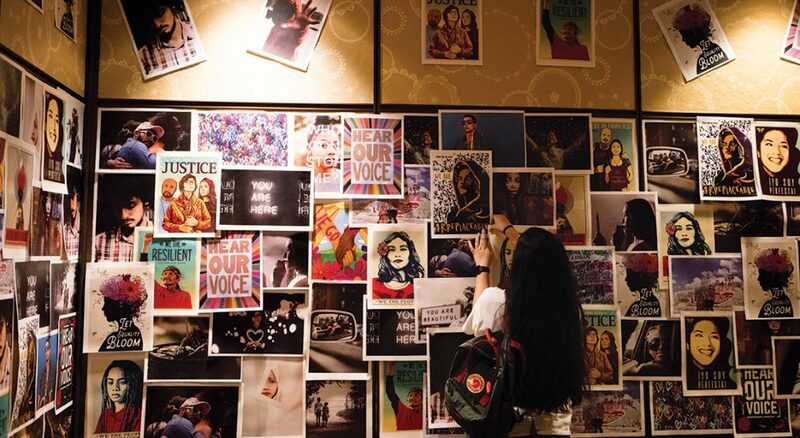 Throughout the event, participants sought understanding and appreciation of different cultures and ethnicities, all while claiming their own identity and faith. 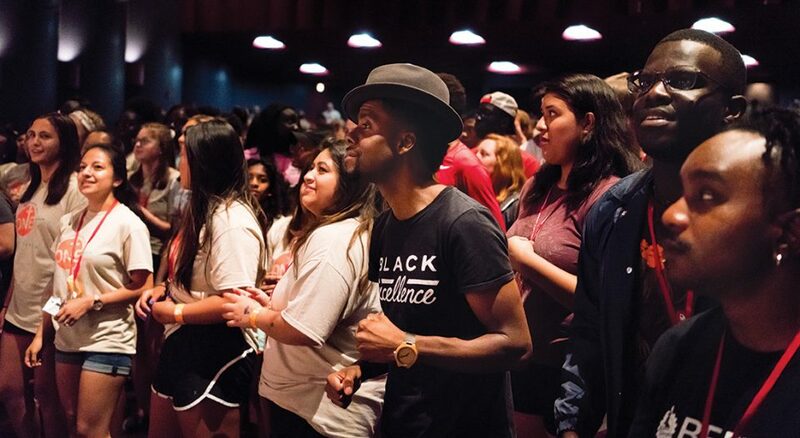 During closing worship, Yehiel Curry, pastor of Shekinah Chapel in Riverdale, Ill., said he felt inspired after seeing the connections made during MYLE, and he encouraged participants to continue building community. “I belong because Jesus loves me,” Joey Baar from Living Lord Lutheran Church in Bradenton, Fla., wrote on a strip of paper before he added it to a prayer chain that was wrapped around the altar at the tAble. The tAble got its new name and theme after the pre-event was revisioned, said Sarah Mayer-Flatt, the team leader. 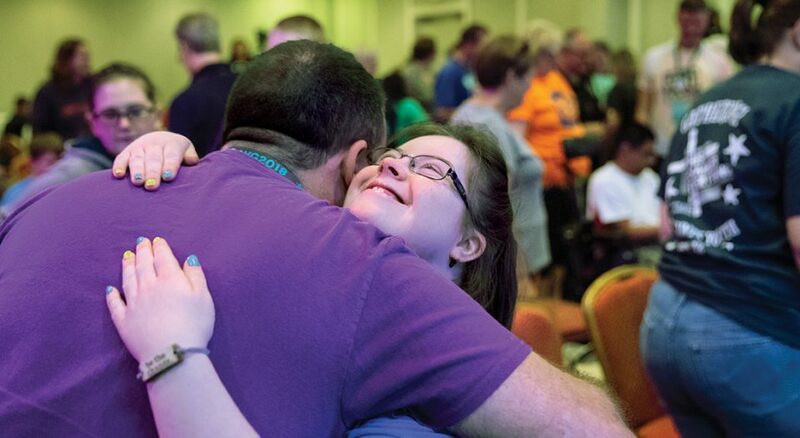 Organizers wanted the focus to be on making it an intentional Christian community that would inform people with disabilities and caregivers. “ ‘You belong’ and belonging was really our gift from the Spirit because, of course, you belong at the table,” she added. The event’s almost 80 participants included youth and their caregivers, which contributed to an intimate sense of community. Joey said he had also made some new friends and was having “so much fun” during his time at the tAble. Psalm 139 provided foundation for the event as activities and worship services focused on the message that everyone is “fearfully and wonderfully made” and is named and claimed by God just as they are. During a service project, youth put together 200 “Grace Bags,” which were filled with nonperishable food and toiletry items to be distributed to people who are homeless. They also created “Kindness Rocks” by painting rocks with designs, pictures and hopeful messages. During their tour of the NRG Center, they hid the rocks for Gathering participants to find throughout the week. The tour of NRG Center and also NRG Stadium gave the tAble participants and their caregivers an opportunity to familiarize themselves with some of the main locations they would be in during the Gathering. It also gave them a chance to participate early in some of the activities in the Interactive Learning Center, including the ropes course. Throughout their time together, the youth talked about how God can be revealed through their gifts and strengths, which was exemplified and celebrated during “The tAble’s Got Talent Show,” where they shared their talents in dance, song and poetry, among others. Participants also heard about sharing gifts during a concert by Ginny Owens, who later performed during the Gathering. While she played some of her songs, Owens reminded everyone that God strengthens their gifts and calls them to use them in the world. 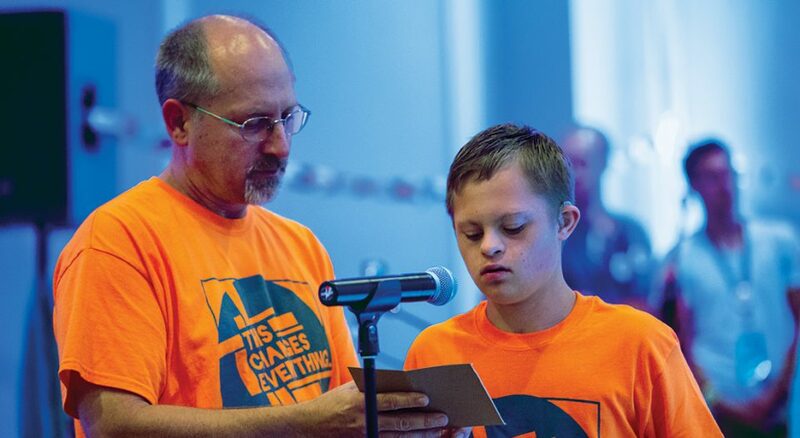 Several of the tAble participants had leadership roles during closing worship, which gave another opportunity for them to connect to their faith and use their strengths as gifts for the church. Mayer-Flatt said the goal of the event was to show participants something they might not usually see in the world—that everyone belongs and has room at Christ’s table.